It has to be said that the German wine industry has only itself to blame for the suspicion with which many consumers view its wines. A greedy approach in the past 20 years or so has seen massive plantings of mediocre grape varieties on undistinguished sites, over-production, and sugary-sweet wines with little appeal for true wine-lovers. This is a great tragedy for Germany’s many, many fine wine-makers. They have stuck to their guns to grow the Riesling grape on difficult, steeply sloping sites, producing wines that are the best examples of their type in the world. Like the Northern French vineyards, this is a cool-climate area where sites have to be chosen carefully: preferably on south-facing hillside slopes. In the southerly regions of Pfalz and Baden the climate is less of a problem, but in the great northern wine areas around the Mosel Valley and the Rhine, incredibly steep slopes are the only way to ensure each vine gets enough sunshine to ripen the grapes. There is relatively light rainfall, so the growing season is quite long, and where conditions are right, Botrytis can produce wonderful dessert wines. Production is centred around great rivers like the Rhine and Mosel where the soil tends to be predominantly slate on mineral-rich earth. The white wines of Germany are its glory. There are a wide variety of grapes planted, many of them laboratory-developed hybrids and Riesling crosses like Müller-Thurgau, Ortega and Rieslaner, designed not so much with quality in mind, but simply to ripen to high sugar levels. To understand why the German wine industry rushed towards these varieties, see the German classification system below. Scheurebe, Ruländer, Silvaner, Gewürztraminer and Weissburgunder. Spätburgunder, Dornfelder, Portugieser and Trollinger. 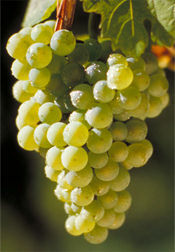 The Weissburgunder is the grape known as Pinot Blanc in France, the Spätburgunder is the Pinot Noir. The current strict and detailed wine laws go back to 1971. Since then, the official Quality status assigned to a wine depends entirely on how much sugar was in the grapes at the time of harvest. The theory was that only the very best sited vineyards would produce really ripe grapes. The unforeseen consequence however, was that the finest, but also unreliable varieties such as Riesling were abandoned in favour of less distinguished varieties. These were scientifically designed to guarantee high sugar levels and thus, in name at least, an official stamp of quality. The end of the 1980’s and 1990’s has seen something of a grass-roots revolution amongst quality-conscious estates, who have formed alliances with like-minded producers and established their own quality charters for their wines. To a certain extent the German wine trade is still in some turmoil, with various moves – towards dry wines, red wines, barrel fermented wines – seeking to find new markets and new directions. Tafelwein – tablewine, the grapes for which needn’t even be German. Landwein – roughly the equivalent of France’s Vin de Pays. Usually not of high quality. Qualitätswein bestimmter Anbaugebiete (QbA) – the first level regarded as “quality” wine by the EU. Grapes must come from demarcated regions, which will appear on the label. This is Germany’s basic, everyday wine. The ubiquitous Liebfraumilch is an example of a QbA wine. Trockenbeerenauslese – fully noble-rotted grapes. Always sweet. Eiswein – super-sweet; grapes harvested whilst frozen. A collection of vineyard areas on the river Mosel and its tributaries the Saar and Ruwer. The Mosel rises in France (as the Moselle) and flows through Luxembourg before reaching Germany. From some of the well known villages of this area like Piesport, Bernkastel and Erden come sublime Riesling wines. These wines are never “big” powerhouse wines: they are invariably low alcohol, intensely flavoured wines that balance slatey, mineral qualities with honeyed sweetness and rapier-like acidity. This ancient and aristocratic region has many famous wine villages such as Hochheim, Eltville and Johannisberg. Sited along the north bank of the Rhine, its steep, south-facing slopes produce superb Rieslings with a little more weight than those of M-S-R, but just as long-lived and perfectly balanced. The village of Assmannshausen is one of the few centres for Red wine production in Germany. A large area south of the river Rhine, wines from the region vary in quality, but the best from villages like Nierstein and Nackenheim are explosively fruity and as good as any in Germany. Warm conditions mean easier ripening of grapes. A lot of the production is the highly commercial stuff that does Germany’s reputation for fine wines few favours. It is also an area where very interesting experimental wines are made, including oak-aged wines (unheard of in Germany), Pinots Noirs and other Burgundy varieties. There are great classic Rieslings too, and a lot of high quality sweet wine. Whether a result of global warming or simply dedicated winemakers identifying the most suitable sites, Germany has an increasingly impressive red wine industry in the 21st century, especially for Pinot Noir. Some hotspots for Pinot see growers dedicated to the variety, making excellent wines that command serious prices among both domestic and international enthusiasts. One of the problems that even the finest German wine-makers have faced in recent years is that off-dry and semi-sweet wines are just out of favour with most consumers. The world is looking for wine to drink with food by and large, and that means dry whites and reds. Because of this, many German producers are cutting-back their production of traditional styles to make trocken or halbtrocken wines (dry or semi-dry). These wines are more like the wines of Alsace, in that they are fermented out fully to have higher alcohol and lower sugar. Note that these wines will still qualify to be sold at QmP levels of Kabinett, Spätlese, etc. But within the trocken context this is no longer an indication of sweetness, more an indication of how full-bodied and alcoholic the wine will be. Personally, I have found few trocken wines below Auslese level that have had sufficient fruit to be really balanced, but I also note that there is progress and the dry wines of Germany are improving all the time. A small and personal selection of German producers would include: von Schubert, Dr Loosen, Von Kesselstatt, Künstler, Deinhard, Dönnhoff, Weil and Gunderloch.